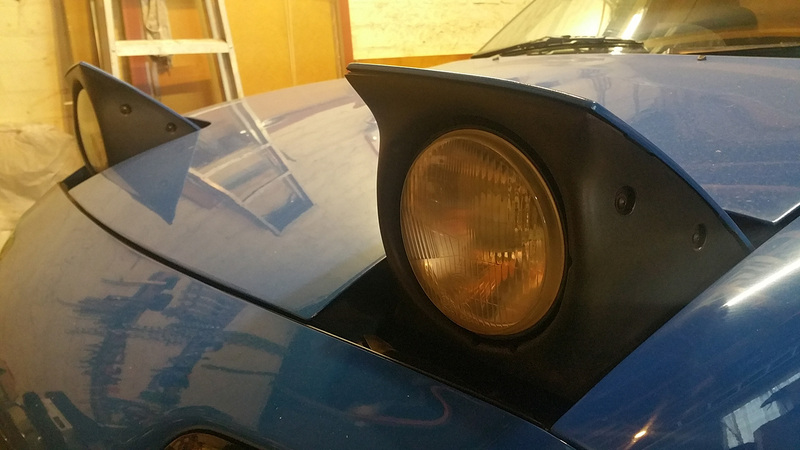 A while ago I saw on YouTube how one fellow enthusiast fitted the round 7`` LED headlights from new JEEP models to his Miata. There are a few different designs to choose from, and the aftermarket has even more options. I particularly liked the round halo design, so I took the plunge and ordered a set for my car. That video explains very well the process and the few pitfalls to look out for when fitting it. I ordered my kit from e-bay, and yes, I had to dremel some of the cover away, and tie back all of the heavy wiring quite tightly too (twice!). But it is plug-and-play for the most part, unless you also want the indicator lights to function. And that’s the thing here. Two and a bit decades and an entire ocean apart, and the three notches on the new American LED lights fits exactly into the offset non-symmetrical pattern on the Japanese Miata’s fixtures. The three-way low and hi-beam plug is the same too, and literally just plugs in. The only real work I did here was to splice into my indicator wires to get a line for the halo’s amber circuit. The only negative side effect of this install is that these units are rather heavy and bulky with solid aluminium housings. It adds a fair amount of weight over the standard bulbs, and it rattles the headlights on the hinges quite a bit on bumpy roads when they're up. Whether this will cause any long-term damage remains to be seen. And as I understand, it also fits on the old Mark 1 (Rabbit in the US) and Citi Golfs here in SA too, since it’s the same size and presumably follows the same standard. In fact, the Germans probably set the standard with the Beetle? The right-hand headlight, tucked in and all tied down. Count the cable ties - 5 of them! The LED control unit is rather bulky, and there's a lot of additional wire to keep out of reach of the guide-arm. You can also see where I took parts of the housing off for the fitment. The final result. Mind the really dirty car. We have a truly critical water shortage in Cape Town. The comments I got? It now looks like an Anime character, crying.